SAE Products® Grease Fitting Installation and Repair Tool. All-in one installation / repair tool for 1/8" NPT grease fittings. 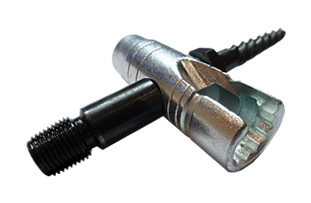 Wrench installs 1/8" NPT straight, or angle fittings and removes broken fittings with a 7/16" or 3/8" Hex. Tap repairs / rethread's 1/8" NPT threaded holes. Made in The USA.